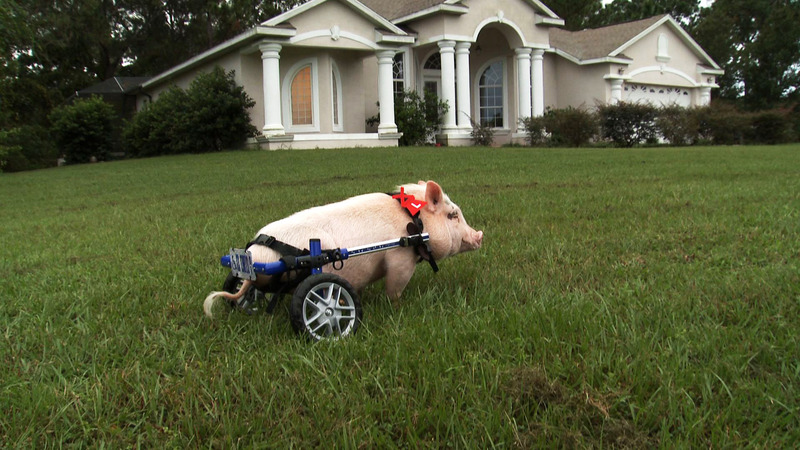 Chris P. Bacon takes a spin on his home turf in NATURE: MY BIONIC PET. Photo courtesy of Kevin Bachar. c 2014 THIRTEEN Productions LLC. If, like me, you’ve been dodging the depressing influx of documentaries about the decimation and mistreatment of whales, dolphins, chimps, elephants and other endangered animal species, I suggest you tune in the latest episode of NATURE on PBS tonight (Weds., April 9, at 8:00 p.m. ET. Check local listings. ) for some much better news. In a mere 55 minutes, My Bionic Pet will lift your spirits and your respect for the animal kingdom and some remarkably good people who are giving physically challenged animals a second chance at life. The film, produced by Kevin Bachar and Andy Seestedt for THIRTEEN, highlights the work being done in the U.S., from coast to coast, and Canada, by some dedicated veterinarians, prosthetic specialists and animal guardians to transform the lives of disabled animals. The animals featured here–ranging from dogs, a pig and pony to an alligator, llama and a swan–have through birth deformity, disease, mistreatment or accidents been left without functioning limbs, beaks or tails. 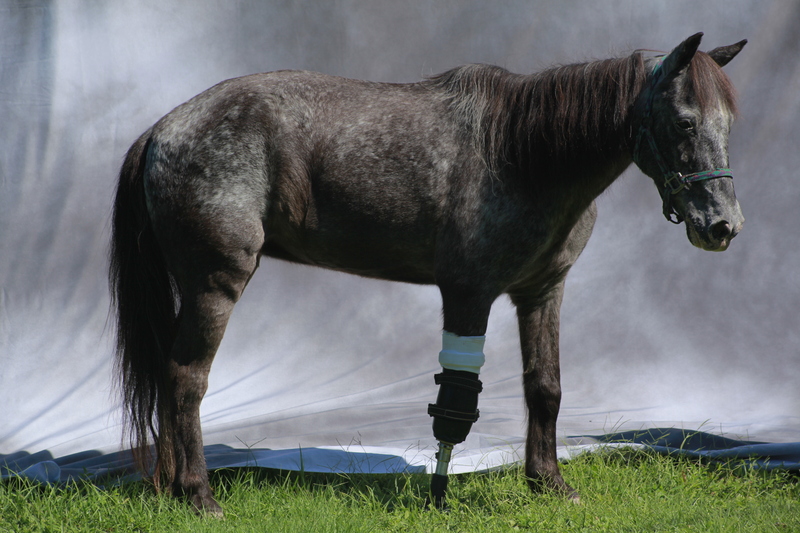 But all show remarkable resilience when fitted with prostheses. The meticulous creation of their prostheses is case driven and often a matter of trial and error; the tie between human and animal anatomy and technologies is reciprocal and a necessity. Molly, one of the stars of NATURE: MY BIONIC PET. Photo courtesy of Lizette Gesuden. c 2014 THIRTEEN Productions LLC. The transformation in the lives of these animals (and those of their caregivers and guardians) is immediate and joyous to behold. You’ll fall in love with Chris. P. Bacon, the adorable piglet who now zips around on his wheelie and is the subject of the first in a series of children’s books published by Hay House. There’s Molly, the pony whose remarkable survival, from the ravages of Hurricane Katrina and her subsequent post-storm attack by a dog, has led to her therapeutic work with disabled children in New Orleans. And certified therapy dog Journey, born without a front left paw, is a welcome guest at a Florida children’s hospital and an inspiration and comfort to adult human amputees adjusting to prosthetics. And perhaps just as moving are the humans here who will inspire you with their love and dedication to these animals. In the end you may ask, “Can prosthetics make animals happy?” My Bionic Pet answers that question. Journey inspires visitors at Westcoast Brace and Limb in Tampa, FL. Photo courtesy of Kevin Bachar. c 2014 THIRTEEN Productions LLC. This entry was posted in TV and tagged Animal Prosthetics, Animals, Chris P. Bacon, Disabilities, Dr. Len Lucero, Hay House, Kevin Bachar, My Bionic Pet, NATURE, PBS, Pets, Prosthetics, THIRTEEN WNET. Bookmark the permalink. This was a fabulous article! Yep, and he’s adorable! Chris got his name and his chance at a long, healthy life (far from the frying pan) from his best pal and guardian, veterinarian Dr. Len Lucero. They’re quite a pair! Check out the children’s book about Chris P., published in 2013 by Hay House (see link in my post).